View More In Iced Tea Glasses. Attractively serve water, soft-drinks, highballs and beer in Inverness glasses. Smooth-rounded rim slowly transitions to a faceted base. Thick, flat pentagon-shaped bottom ensures stability. DuraTuff thermal treatment enhances durability, prolonging service life. 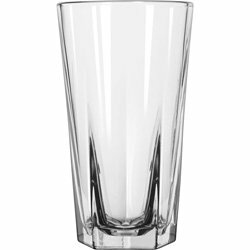 Cup Type: Cold; Capacity (Volume): 15.250 oz; Material(s): Glass. ~ Includes 24 glasses per case.